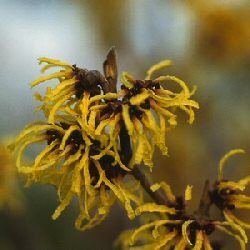 The Witch Hazel Arnold Promise (Hamamelis intermedia 'Arnold Promise') is distinguished by its striking beautiful bright yellow, fragranted flowers, which appear during June. Its attractive rounded foliage provides brilliant autumn colours. An upright tree, strong-growing tree, with a compact form it hails from the United States. With a height of up to 4 metres (13 ft) after 10 years, we highly recommend this tree for a small garden. We do, however, advise against planting this tree on very dry, limey soils, although well drained soil is its preference. Our Witch Hazel trees are supplied at a height of between 0.7 to 1.0 metres in a 12 Litre container, which means that the tree can be planted any time of the year and with better results than either bare-root or rootball trees.